A single user account or set of accounts can be temporarily inactivated. Once an account is inactivated, a user cannot bind to the directory. The authentication operation will fail. Users and roles are inactivated using the operational attribute nsAccountLock. When an entry contains the nsAccountLock attribute with a value of true, the server rejects the bind. The same procedures are used to inactivate users and roles. However, when a role is inactivated, the members of the role are inactivated, not the role entry itself. For more information about roles in general and how roles interact with access control in particular, see Chapter 8, Organizing and Grouping Entries. The root entry (the entry corresponding to the root or sub suffix) on a database cannot be inactivated. Chapter 3, Managing Directory Entries has information on creating the entry for a root or sub suffix, and Chapter 2, Configuring Directory Databases has information on creating root and sub suffixes. Select the View menu, and select the Display item. Select the Inactivation State item. When the inactivation state is visible, any inactive object is listed in the right pane of the Console with a red slash through it. All user and role entries are active by default. They must be manually marked inactive and, once inactivated, must be manually re-activated. 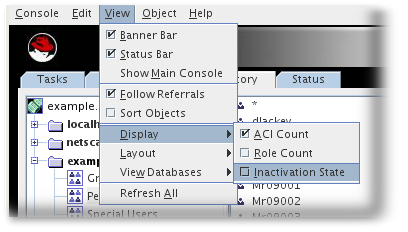 Browse the navigation tree in the left navigation pane, and double-click the entry to inactivate. Click Account in the left pane. The right pane states that the role or user is activate. Click the Inactivate button to inactivate the user or role (or the Activate button, to re-enable the entry). Alternatively, highlight the entry and select Inactivate (or Activate, if appropriate) from the Object menu. The ns-accountstatus.pl script is used to obtain detailed information about active and inactive users. # ns-accountstatus.pl -D "cn=Directory Manager" -w password -I "uid=jsmith,ou=people,dc=example,dc=com"
As you can see from the last three lines of the output, this account is currently active, but will expire soon. The Directory Server uses dual scripts to inactivate or activate entries through the command line. The ns-inactivate.pl and ns-activate.pl script share similar options to identify the entry to modify, as listed in the Red Hat Directory Server Configuration, Command, and File Reference. [root@server ~]# ns-inactivate.pl -Z instance_name -D Directory Manager -w secret -p 389 -h example.com  -I "uid=jfrasier,ou=people,dc=example,dc=com"
# ns-activate.pl -Z instance_name -D Directory Manager -w secret -p 389 -h example.com  -I "uid=jfrasier,ou=people,dc=example,dc=com"